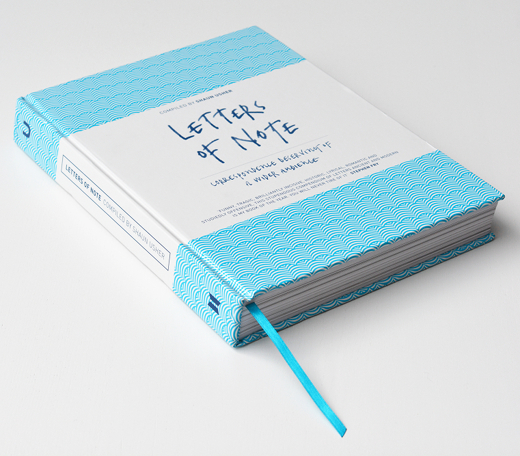 After what seems like decades, the GORGEOUS Letters of Note book will be available to buy in all sensible UK shops this Thursday (24th)—info and photos here. Those who ordered the special edition via Unbound: as mentioned in the email you hopefully received the other week, yours will arrive on your doorsteps mid-November looking wonderful and a little different to the one pictured above. Incidentally, that collectible edition can still be bought at the Unbound website. 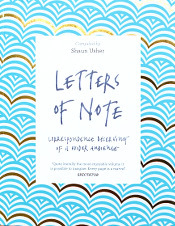 This Wednesday (24th) at 6:30pm, I'll be at Waterstones Piccadilly giving a talk/having a chat with Simon Garfield—author of the fantastic, highly recommended new book, To the Letter—on the subject of letters. It should be a great evening. The book will also be available to buy. For info about tickets, click here. 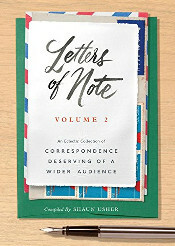 Finally, I'm delighted to say that Letters of Note will be published in the US on May 6th, 2014, courtesy of Chronicle Books. More info as I get it. Questions can be directed towards shaun@lettersofnote.com. P.S. This website will be back to normal, regularly updated, in a couple of weeks.